I woke up early this morning so I can grab some opps while the kids are still asleep and I got lucky to have one. After I got done and submitted it, I started preparing the ingredients I need for our breakfast. I was in the middle when everything came off.. Oh my, I totally forgot about the power outage today. Not a good situation during summer, whew! But anyhow, I told my kids if they would like to go to the Gym so we can play while the electric is out. They like the idea so we head out there and played for about two hours and then came back home. 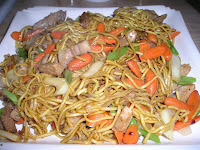 When the power resumed, I cooked our suppose to be breakfast YAKISOBA and ate it for brunch. Masarap na pansit mga kababayan! 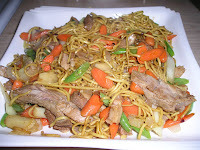 Miss ko na kasi ang pansit hehehe..